Be cautious of your surroundings before starting your grill. Remain a good distance away from the house, anything low hanging, or anything flammable. Clean grease from grill top after every use. Accumulated grease on your grill can lead to an unsafe fire hazard. Have a fire extinguisher on hand. In the event of an out of control fire, a fire extinguisher will help exhaust the flames. Close or cover extinguished grill when not in use. This will help prevent any unwanted sparks or flare-ups, as well as allow the heat from charcoals to burn off. If using a gas grill remember to cut the gas to the grill after use. Use a metal lid or cookie sheet to cover the flames. Leave it covered until the fire has cooled. For a small and manageable fire, pour salt or baking soda on it to extinguish the fire. If necessary, use a Class B dry chemical fire extinguisher. *** Do not try to extinguish the fire with water. *** Do not attempt to move the pot or pan outside. Before firework use, be sure to read all firework descriptions and warning labels. Failure to do so could lead to unexpected explosions and cause possible injuries. Soak fireworks in water before disposing of. Fireworks will remain hot for a short period after ignition so do not try to throw away right away. After an adequate amount of time has gone by, submerge fireworks into the water. 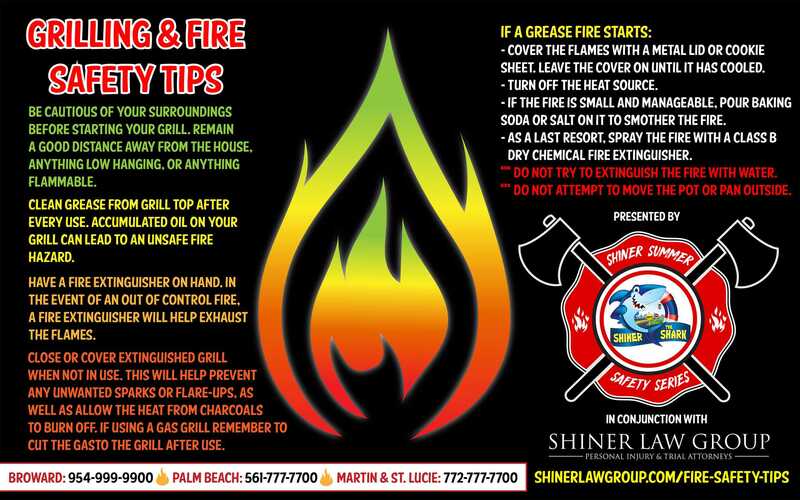 This extra precaution will ensure you will not be met with any unexpected fires. Shiner Law Group wants you to celebrate safely this summer. Have fun with your friends and family but be cautious of all the potential hazards when barbecuing or enjoying campfires. If you find yourself or a loved one injured in an accident remember your friends at Shiner Law Group. You can call us at 561-777-7700 or click here for a free case evaluation.